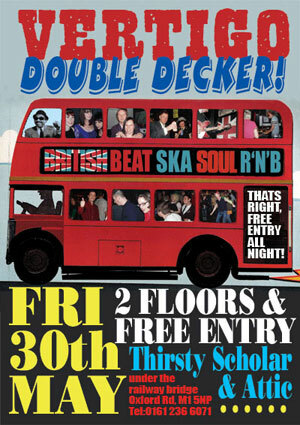 See above for the details of the next Vertigo Double Decker in Manchester, taking place on Friday 30th May 2008. Two floors and free entry, with 60s Beat, R’n’B, Early Northern sounds, Ska and Blues i The Attic, with modern 60s influenced Indie, 2 tone, Mod revival and Classic 60s in the basement. It runs from 9pm until 3am. To find out more or to get a DJ spot, email [email protected].